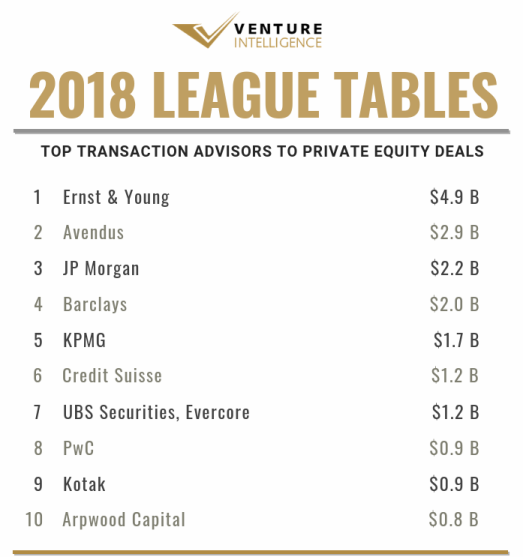 EY topped the Venture Intelligence League Table for Transaction Advisor to Private Equity Transactions in 2018. EY advised PE deals worth $4.9 Billion (across 17 qualifying deals) during the period. 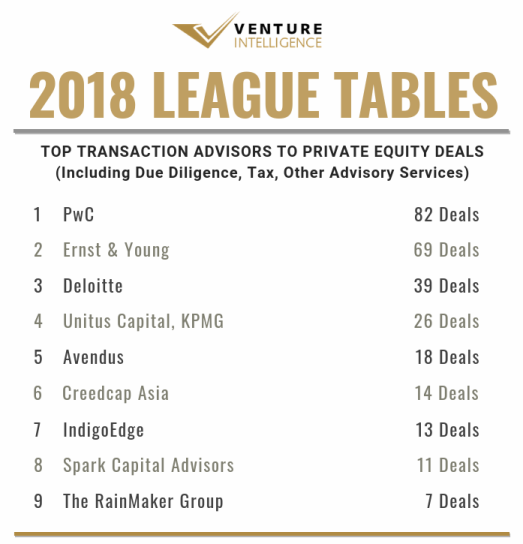 Avendus ($2.9 Billion across 18 deals) and JP Morgan ($2.2 Billion across 2 deals) took the second and third spot. Barclays ($2 Billion across 3 deals) and KPMG ($1.7 Billion across 7 deals) completed the top five in 2018. EY advised deals during the year include Macquarie's $1.5 Billion investment in NHAI Toll-Operate-Transfer (TOT) Bundle and Blackstone's investment in Indiabulls' commercial assets in Mumbai. Avendus advised deals include the Naspers-led $1 Billion round in food delivery company Swiggy and Temasek's $250 million investment in IT Services firm UST Global. JP Morgan advised deals include the $1.2 Billion infusion by Abu Dhabi Investment Authority and TPG in UPL Limited and SoftBank's $1 Billion investment in Oyo Rooms. 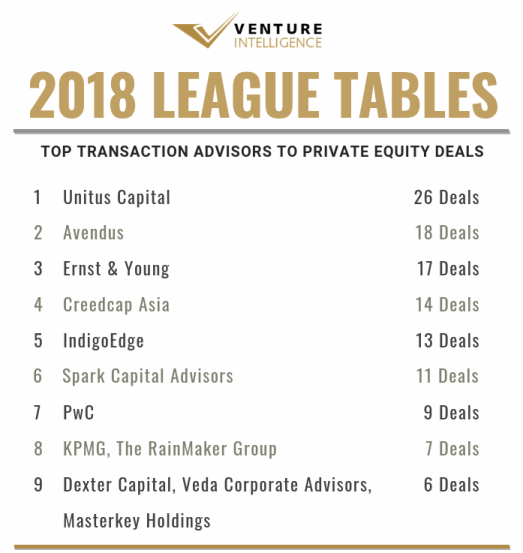 Unitus Capital topped the tables in terms of deal volume with 26 deals during the year followed by Avendus. 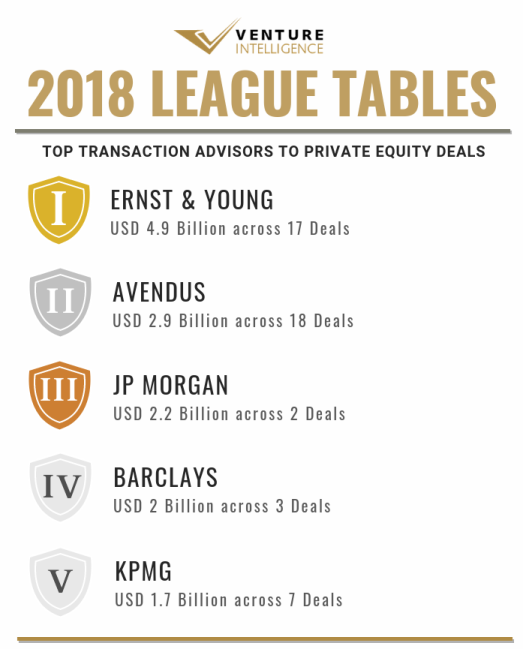 EY took the third place advising 17 deals. Creedcap Asia (with 14 deals) and IndigoEdge (with 13 deals) occupied the fourth and fifth place respectively. 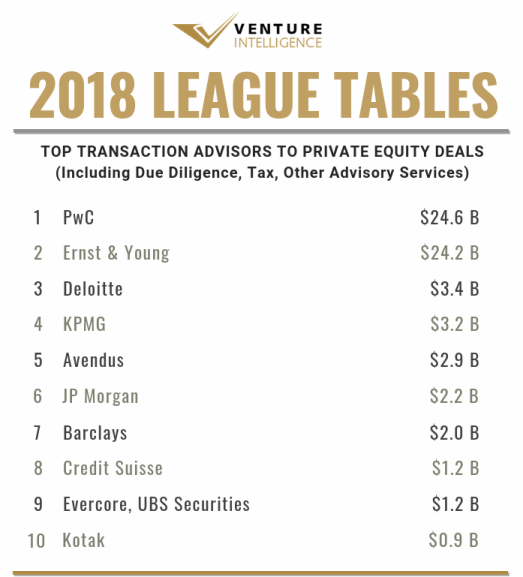 Inclusive of its roles in due diligence and related advisory activities, PwC topped the tables advising deals with a value tag of $24.6 Billion (across a total of 82 qualifying deals) during 2018. EY followed closely advising deals worth $24.2 Billion. Deloitte took the third spot with $3.3 Billion (across 39 qualifying deals). 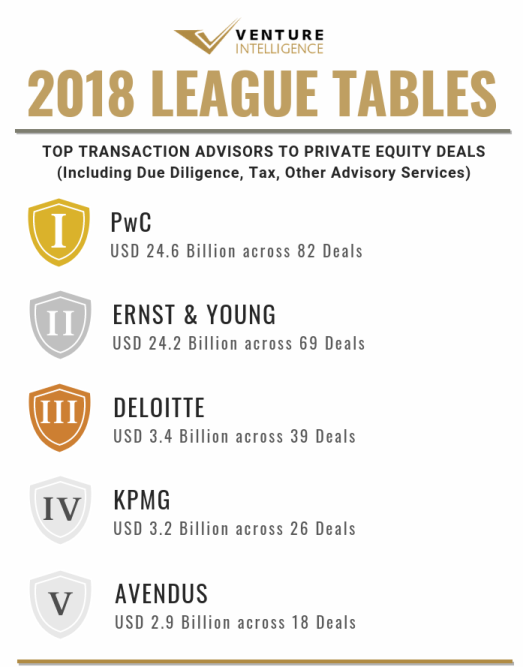 KPMG ($3.2 Billion) and Avendus took the the fourth and fifth spots respectively.